With 1:38 remaining Friday night at Cox Pavilion, it looked like Clark High School could start finding room for another banner after a successful ending in its #FightForFour. 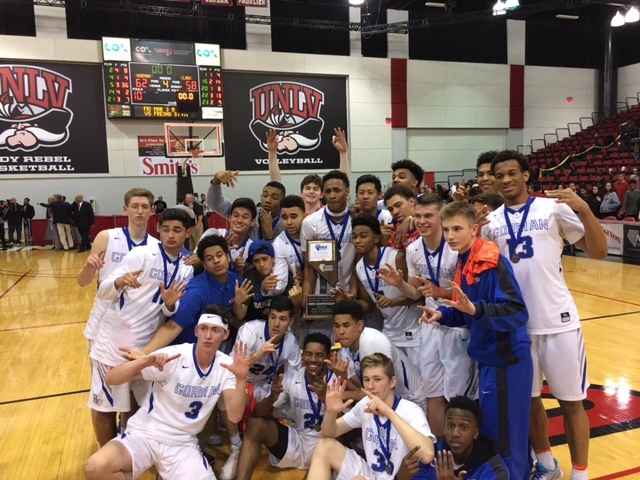 The Chargers, who moved up from 3A this season after winning three consecutive championships at that level, led Bishop Gorman 58-50 in the NIAA state 4A final after a nice spinning drive by sophomore guard Trey Woodbury. Clark’s defense had forced 16 turnovers and the only thing keeping the Gaels around was a spectacular offensive performance by senior guard Chuck O’Bannon. But the Gaels (22-9) turned up the heat with some smothering defense that produced five steals over an 87-second span and ended the game with a 12-0 run to pull out a stunning 62-58 victory. 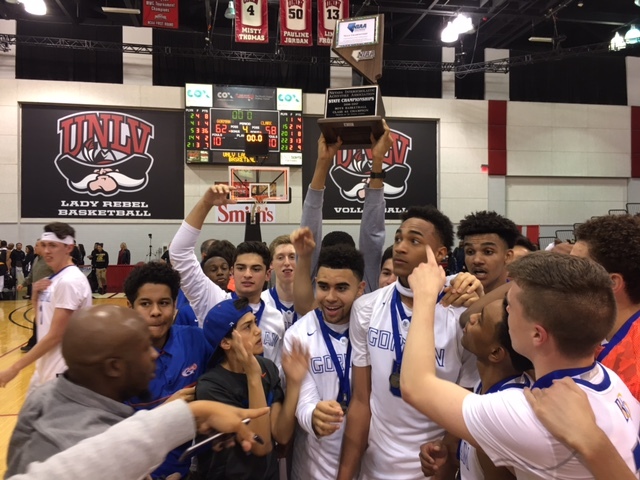 The USC-bound O’Bannon finished with 36 points, including 6-of-10 3-pointers, and 11 rebounds while senior point guard Christian Popoola Jr. had six points and had four steals during the dramatic comeback as Bishop Gorman won its sixth consecutive state championship. Popoola, who had scored just one point and had five turnovers up to that point, started the comeback with a 3-pointer with 1:27 to go to cut Clark’s lead to 58-53. He then followed that up with a steal on the press against Charger sophomore guard Jalen Hill and was fouled. He sank two free throws to make it 58-55 with 1:18 left. The Chargers (27-5), who were out of timeouts, got the ball over midcourt this time and went into a delay game but junior guard DJ Howe stole the ball from sophomore forward Antwon Jackson at the top of the key and was fouled. Howe hit the front end of a one-and-one to cut the deficit to 58-56 with 41.6 seconds left. Popoola then came up with another steal and fed junior Jamal Bey who missed a dunk but the 5-foot-9 Howe got arguably the biggest rebound of the season for the Gaels and was fouled. This time he sank both ends of a one-and-one to tie it, 58-58, with 26 seconds left. That was plenty of time for Popoola to come up to come up with yet another steal, poking the ball away from Hill. Bey scooped it up and fed O’Bannon for a dunk and what proved to be the game-winning basket with 15 seconds left. Hill then rushed the ball up the court and missed a contested floater. Howe got the rebound, was fouled and sank one of two free throws with 6.9 seconds left to increase Gorman’s lead to 61-58. Popoola then came up with another steal and sank a free throw with 2.3 seconds left to seal the win. Still, it was O’Bannon’s shooting performance that featured a half-dozen 3-pointers, many of the rainbow variety with a defender in his face, that carried the Gaels and had everyone talking afterward. 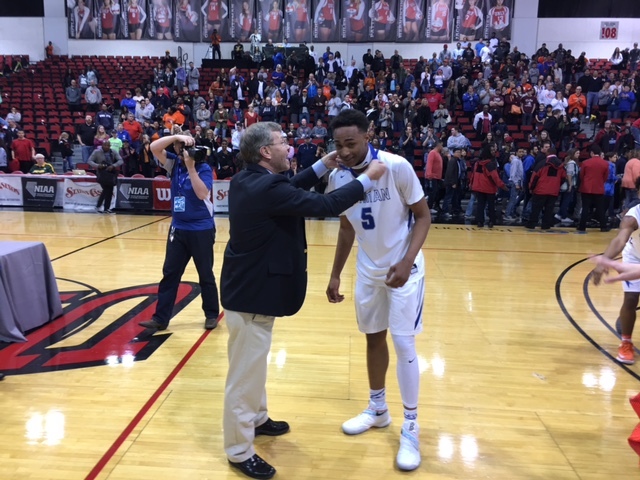 No other Gorman player scored more than eight points. Woodbury, despite battling early foul problems, finished with 15 points to lead Clark with junior guard James Bridges adding 14 points, including 3-of-5 from 3-point range.
.@ClarkHoops what a battle, great for the city! congrats on your season!